For many people, encountering wild animals in their natural habitat is a moving experience. Recent increases in the popularity of this activity can be explained by increasing environmental awareness and, especially for urban-living people, a rediscovery of the beauty and value of biodiversity and its power to enable reconnections with their own inner wild nature. Wild animal encounters enhance psychological, educational and environmental outcomes. Commercial wildlife watching is one of the fastest growing and most popular tourism segments worldwide with an annual growth rate of 10% and an estimated global market size of 12 million trips per year. The Convention on the Conservation of Migratory Species of Wild Animals (UNEP/CMS) expects 1.6 billion international tourists in 2020 with many of them seeking to encounter animal species in the wild. Marine wildlife tourism is a popular subset of this tourism sector and includes a variety of activities in the marine environment, including watching and feeding fish, interactions with stingrays, birdwatching and visits to seabird breeding areas as well as the observation of and interaction with marine mammals. 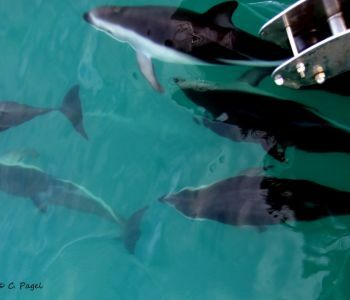 Marine mammal tourism embraces visits to seal colonies, swimming with sea lions and manatees, as well as the watching and swimming with whales and dolphins, and dolphin feeding programmes. From the Arctic to Antarctica, marine wildlife tourism is conducted in many coastal and marine environments within different climate zones.